Recent technology has made LED bulbs more affordable, and you can now find a wide variety of lamps and light fixtures designed to work with LED bulbs or that already have them installed. When transitioning your home to energy-efficient, long-lasting LED lighting, table lamps and floor lamps are a good place to start. 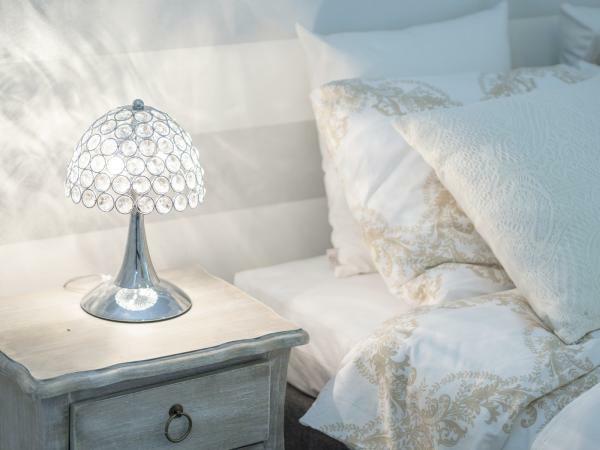 LED table lamps are ideal for providing soft accent lighting practically anywhere in your home. The bulbs can produce a warm, white-colored lighting effect reminiscent of incandescent light or brighter cool white light similar to natural daylight, good for task-oriented applications such as reading or crafting. LED lights are also used to create colorful mood lighting, helping to influence a room's desired atmosphere. This stylish, modern-looking table lamp goes way beyond just brightening a dark corner - its fabulous design combines functional light with mood enhancing accent lighting. Two independent light sources create both an uplight and a downlight, enabling a white task light for reading or other tasks while the second light bathes the surrounding space in colors that energize, stimulate thought or creativity or inspire calm relaxation. Purchase the Hue Beyond Table Lamp as part of a starter kit that includes a bridge. 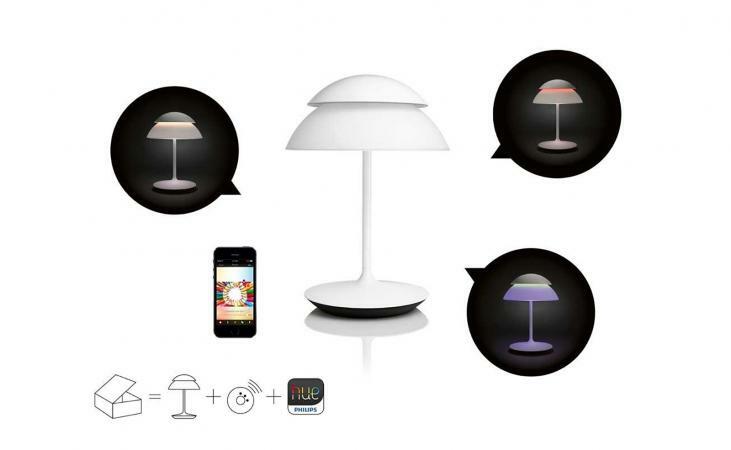 The bridge enables wireless control of the lamp and all of its light settings, including dimmers, timers and colors via the Hue app installed on your smartphone or tablet. This LED lighting system can be expanded with additional Hue lamps, spotlights, light strips, ceiling fixtures and pendant lamps, as a single bridge is capable of controlling up to 50 Hue lamps and light fixtures. The Philips Hue Beyond Table Lamp with starter Kit can be found on Amazon and at Lightology for about $450. 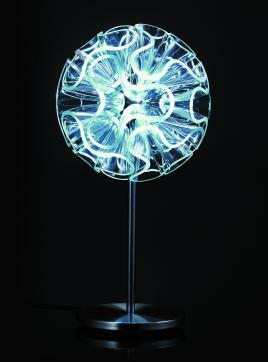 The exquisite design of the Coral 45 Table Lamp is inspired by living coral reefs in tropical oceans. The lamp replicates the shimmering look of natural sunlight softly diffused by water as it shines on the coral's surface. The design team at QisDesign collaborated with Taiwan's National Museum of Marine Biology and Aquarium for their expertise on coral preservation to come up with this fabulous replica of underwater sunlight. This beautiful lamp is available in three different colors of clear white, violet or orange and comes with a 7W LED light installed. Mounted on a sleek stainless steel base, it makes an eye-catching accent light in a modern or contemporary styled home office, living room or bedroom. Placed on a foyer or hallway console table, the lamp makes an interesting and usual accessory that won't go unnoticed. The Coral 45 Table Lamp ranges from about $290-$410, and is available at Interior Deluxe, Wayfair and AllModern. If your home has a coastal theme, you might also be interested in another marine inspired lamp by QisDesigns - the Aurelia Lamp, mimicking the look of the Moon Jellyfish. For a room with more of a rustic or traditional look, the Dimond Lighting Natural Stone LED Table Lamp brings in a classic touch with its traditional Empire shade. The fabulous feature of this lamp is the ceramic base designed to look like a stack of highly polished, smooth round river rocks. Each rock has a deep chocolate brown hue in a natural stone finish. Varying diameters give the base a chunky, natural appearance similar to carved wood. The lamp stands 23 inches tall with a width of 14 inches at the widest part of the dark beige shade and includes a 9.5W LED bulb. A three way switch provides additional light control. The lamp would make a lovely addition to a room painted in earthy muted shades of sage, forest green or varying shades of blue. This lamp would also complement dark wood ceiling beams, dark wood flooring and rooms with walnut colored wood furniture or trim. You can find the Natural Stone LED Table Lamp at Lighting Design Experts for just over $150, featuring rocks with light metallic and white stone finishes and a white fabric shade. 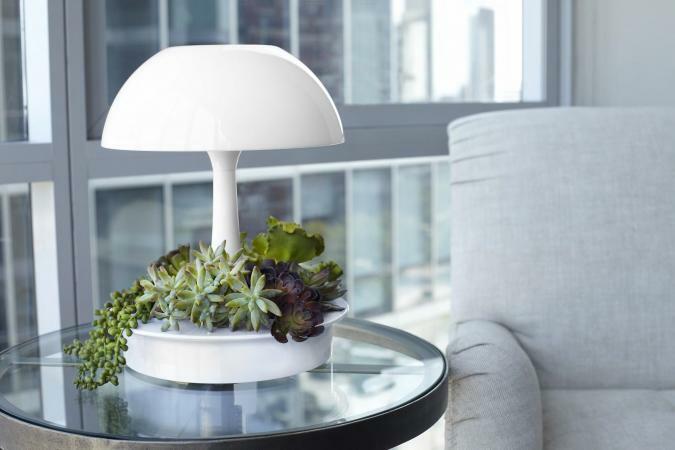 Ambienta is a fabulous multifunctional LED table lamp designed to integrate nature into indoor living spaces. It's the brainchild of French designer Daniel Pouzet and combines a hydroponic growing system with LED lights individually controlled for both the plants and for ambient room light. The lamp is designed to support six plants with the idea of improving the air quality of the surrounding space. Choose from three different predesigned plant palettes to fill the bottom of the lamp with live greenery - a mix of exotic tropical plants, a medley of bushy ferns or a group of sun loving succulents. Placement of the lamp should coincide with the chosen plant palette. For example, ferns thrive in moist, humid environments, so the bathroom would make a good choice for a fern lamp. The lamp itself is a neutral white so you can easily incorporate it into any color scheme. It's clean, simple lines make it a good fit for any modern, minimalist or contemporary home. Ambienta can be found at Sage Greenlife for $270. The plant palettes are sold separately for about $35 each. Add a touch of mood-changing ambience to your dinner table, an outdoor patio table, coffee or side tables with a few Kalis Mood LED Cube lamps by Artkalia. Color changing mood light is diffused through a white polyethylene material layered under a stainless steel frame delicately cut into a large retro-inspired pattern. This cordless cube lamp is rechargeable and comes with a charging base. A fully charged cube will stay illuminated for 6 to 8 hours. Buttons on the bottom of the lamp can be set for steady colors, scrolling colors, fading light and flickering candle light. These fabulous little lamps are wireless, portable and waterproof, making them suitable for indoor and outdoor use. The patterns in the lamp's metal frame produces a groovy 1960s feel. Use these cubes as an eclectic accent in numerous decorating styles, from modern to retro. Place them along steps, wall ledges, window seats or even on your nightstand or desk - any place that could benefit from a subtle mood enhancement. 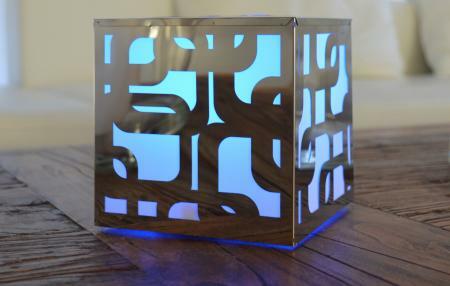 You can purchase the Kalis Mood LED Cube at Lumens.com for around $135. 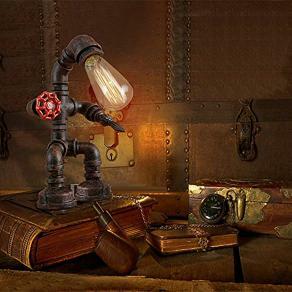 This rustic pipe table or desk lamp designed to look like a 19th-century robot makes a fabulous accessory in a steampunk themed room and would feel right at home in an industrial style loft, a farmhouse or country style home, or as an off-beat antique accent in a modern home. The ever-popular look of vintage-style Edison bulbs can now be found with LED technology. Just look for the proper base size to ensure its compatibility with the lamp - in this case one E26 vintage Edison LED bulb. This type of bulb puts out a soft, warm white light, equivalent to an incandescent light between 25 and 40 W. not quite bright enough for task lighting, the lamp makes a good bedside light or a small accent light to showcase nearby collectibles or knickknacks. You can find the Industrial Retro Style Rust Iron Robot Plumbing Pipe Desk Table Lamp by Baycheer at Amazon for under $80. Whether you need ambient light in the room or reliable task lighting, a floor lamp equipped with LED light will shine efficiently and brightly for the next couple of decades. Koncept has been leading the way in functional LED home lighting for the past 10 years and their award-winning design for the Mosso Pro Floor Lamp is no different. Sleek and refined in style, this highly flexible floor lamp can be adjusted at three different joints along the standing pole, arm and head, positioning the light just where you need it. Touch the glass lens on the lamp head to change the color of the light from warm to cool. Slide your finger along the touch strip on the lamp head to dim the light or make it brighter. A built-in USB port in the base provides convenient charging for smartphones or tablets. 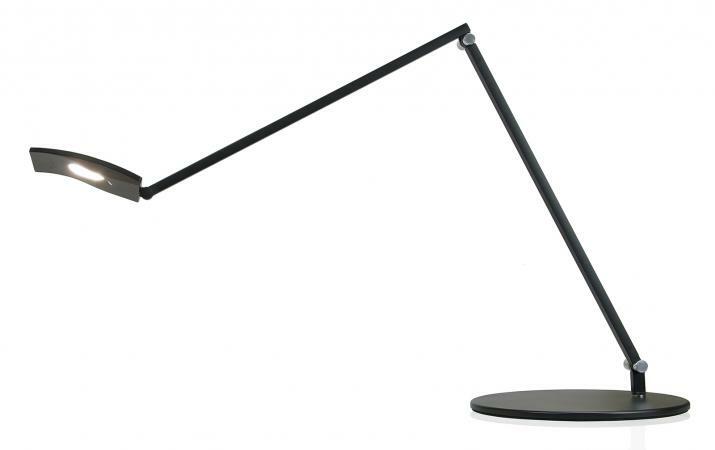 Position this floor lamp near a chair, sofa or desk for a handy reading light that you can adjust for the most comfortable viewing of any size or font of text. Use the cool light setting when crafting to see the truest hue of any color. A sensor in the head automatically turns the lamp off after 15 minutes of inactivity and turns the light back on to its last setting when sensing a presence again. This feature can also be turned off when using the lamp for ambient light. The Mosso Pro Floor Lamp by Koncept is available Wayfair, Interior Design Décor, and 2Modern for just under $350. This stylish floor lamp is yet another design inspired by sea life - in this case, sea urchins commonly found along the Mediterranean coast. Made in Spain by Bover, a company known for innovative, artistic lighting designs, the shade is constructed of woven polyethylene fibers, similar to synthetic wicker and sits atop a stainless steel tripod base. These durable materials make it suitable for outdoor use while also being suitably attractive for indoor use. Both the shade and base come in two finishes, dark brown or ivory white. These light and dark neutrals allow the lamp to complement a wide range of modern, contemporary or even rustic decorating styles. The wicker-like shade helps softly diffuse light emanating from the frosted globe inside, making this lamp a fabulous choice for soft ambient light on a deck, porch or patio or to brighten a dark corner in a spacious great room. Bulbs are not included, so you will need two 10W A19 LED bulbs. 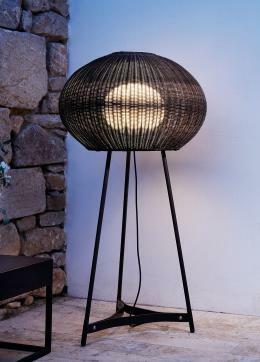 You can find the Garota Tripod Outdoor Floor Lamp at Y Lighting and Lumens for around $1,950. 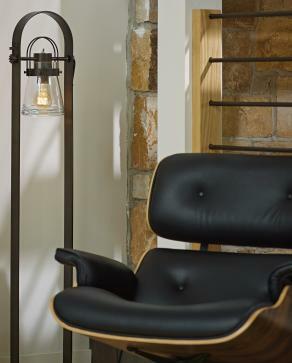 This stunning floor lamp is handmade in Vermont by the award-winning artisans at Hubbardton Forge. Available in 9 fabulous hand forged metal finishes, it is made to order using one of the country's oldest and largest commercial forges. Standing just over four feet high, it makes an elegant addition for lighting a home office, living room, den, or family room styled with traditional décor or used as an eclectic accent in a modern studio loft apartment. The Erlenmeyer Single Light LED Column Floor Lamp is available at Build.com, Lighting Showplace, or Wayfair for about $1,650. New accessories, such as table lamps and floor lamps, can help you update the look of a room or just add that final touch that might be missing. However, you can still transition most, if not all, of your existing lamps and fixtures to LED with the A19 style LED bulb, which has a classic light bulb shape and a retrofit base that screws into a light socket just like an incandescent bulb. Check lamp descriptions and packaging to see if they are compatible with LED bulbs, and if so, which style.